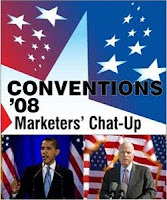 Christina Kerley ("CK") has put together a panel discussion of sorts over on MP Daily Fix where six of us give our (wildly divergent) opinions of Obama's speech last night from a marketing perspective. Panelists include Cam Beck, Stephen Denny, Ann Handley, Drew McClellan, CK and myself. McCain will get the same treatment next week.